Band of Savers: Growing Your Nest Egg: Cash or Investments? 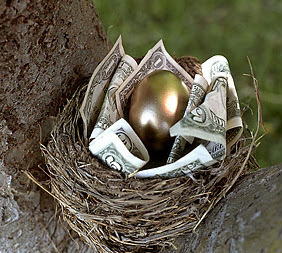 Growing Your Nest Egg: Cash or Investments? I hope you are prepared for a great guest contribution about … oops, I almost pulled a spoiler alert and gave it away. Instead I’m going to let you have the joy of reading what Steph has prepared for us to find out for yourself. Hope you enjoy and get some useful insights out of it! Preparing for the future is one of the biggest things you’ll ever do. It usually takes decades to get your portfolio in the shape you want it, so to eek out the absolute maximum returns from your savings, it’s essential to invest them wisely. There are lots of options open to you: cash holdings, investing in individual companies like Apple or Google, investing in stock markets like the NASDAQ index as a whole, buying up property, purchasing high-value collectibles, and so on. The two most common options are to save hard cash and to invest in the stock markets. Both come with their upsides and downsides, so you need to work out which is the most suitable for you. Cash is, for many people, the safest bet. Firstly, cash isn’t vulnerable to market fluctuations and political upsets; in the event of a financial crash similar to that of 2008, for example, you won’t lose any money unless the institution holding it for you goes under. In any case, you’ll usually be covered by insurance even if this happens; in the UK, for example, deposits of up to £75,000 are covered by the Financial Services Compensation Scheme [Editor’s note: $250,000 in the US under FDIC]. The same can’t be said for other kinds of investments like shares or luxury items. Liquid funds are also accessible immediately. That means if you need to spread them around, or withdraw some in the event of an emergency, you can do so, giving you that peace of mind that doesn’t come from other kinds of investments. There’s also the obvious, but valid point that you don’t need any financial expertise to save cash. Unlike other types of investments, there are no complex financial instruments to get to grips with before you know you’ve made the right call. Interest rates are at historic lows right now. The Bank of England’s base interest rate remains a meagre 0.25%, and looks highly unlikely to change any time soon. Americans are faring slightly better; the Federal Reserve currently sets the rate at 0.75% amid rumors of an imminent increase. Unfortunately, average rates for consumers rarely surpass 1% or so - hardly a generous return on even a sizable nest egg. The low risk that comes with saving cash rather than making investments translates into much more modest returns than higher risk strategies like stocks. If you’re saving for the long term, there’s also the possibility you’ll be hit by rising inflation if you keep your funds in cash. The global inflation rate currently stands at 2.78% per year - which is a lot of money over the long term. If, for example, you were saving for a deposit on a property and planning to buy in ten years, you could find that the buying power of your money has been significantly lessened over the course of those ten years, delaying the point at which you can make the purchase. The most obvious reason to put your nest egg into shares is the scale of the potential reward; some studies have shown that a modest investment on the stock market, made thirty years ago, would likely now be worth more than ten times its original value. That return does, however, assume all dividends paid were reinvested. London’s FTSE 100 index, for example, has steadily climbed to almost five times its value in 1987, having bounced back from the 2008 financial crash. The S&P 500, which tracks the USA’s 500 biggest firms, is now worth almost ten times what it was twenty years ago. In Australia, meanwhile, the ASX stock exchange has seen a similar performance. Cash savings simply don’t bring in those kinds of returns. Your money can grow even more if you put it into an investment fund. BlackRock, for example, operates globally and will work with your financial adviser to put your capital into an investment portfolio that suits you, returning dividends regularly. The stock market is also, of course, subject to lots of volatility. Events unforeseen by investors, like an oil price plunge or a corporate scandal, can instantly wipe billions off the value of a global corporation - meaning you could immediately and irreversibly lose much or even all of your funds. Any independent financial advisor will tell you that the most consistently strong returns come from maintaining a balanced portfolio. It’s therefore wise to opt for both cash savings and stock market investments, leaning more towards one or the other depending on the amount of risk you’re prepared to take on.